Devil’s Claw is indigenous to southern Africa, and is named for the tiny hooks that cover its fruit. Historically, it has been used to treat pain, liver and kidney problems, fever and malaria, and was added to topical ointments to heal sores, boils and other skin problems. In the early 1900s, devil’s claw was introduced to Europe, where the dried roots were used to restore appetite, relieve heartburn and reduce pain and inflammation. Today, the herb is used to fight inflammation or to relieve pain caused by arthritis, headache and sciatica. It is approved as a non-prescription medicine by the German Commission E and is used widely in Germany and France. The roots and tubers are used as medicine. Devil’s claw contains iridoid glycosides, compounds that are believed to have strong anti-inflammatory effects. One type of iridoid, harpagoside, is highly concentrated in the roots and laboratory tests suggest it may have significant pain-relieving and anti-inflammatory properties. In addition, a review of 12 studies indicated that the herb was at least moderately effective for arthritis of the spine, hip and knee. Devil’s claw treats degenerative musculo-skeletal and joint conditions such as arthritis, osteoporosis, rheumatism and gout. Containing natural anti-inflammatories, devil’s claw can help ease pain and reduce swelling associated with arthritis and rheumatism, as well as bursitis and tendonitis. Eases pain of headache, allergies, lumbago, neuralgia and fever. A number of professional herbalists also recommend devil’s claw to treat upset stomach and loss of appetite. To make devil’s claw tea, add one teaspoon of the powdered root to a cup of water in a saucepan and simmer for 15 minutes. Drink a cup three times a day. 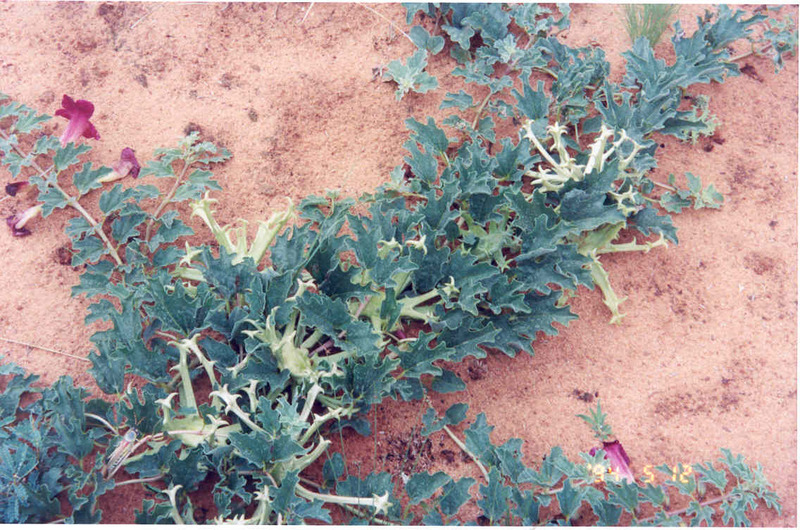 Devil’s claw contains substances that give it a bitter taste, so is not used for culinary purposes. With its origins in the dry savanna and desert areas of southern Africa (in Namibia, southern Botswana, the Kgalagadi region and South Africa), devil’s claw is now grown in the North West and Northern Cape provinces, and in the western Free State. This leafy perennial with branching roots and shoots is planted from seeds, which are difficult to harvest, and it takes four years for the plants to mature and the storage tubers to be ready for harvesting.